The first issue to deal with to isolate a room from other room areas in a home is floor-borne vibration. As sub-woofers usually sit directly on the floor, in addition to main speakers also being located there, this is a major source of sound transmission to other rooms through the framing structure. 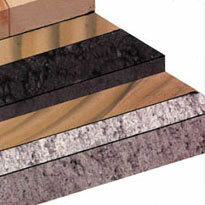 Wood floors are good sound transmitters, but you would be surprised at how much sound concrete can transmit, as well. Carpeting helps some, but in order to both quiet the floor and also de-couple it from the wall framing, Sound Control for your Floors, such as our Floor Isolation Underlayment mats, is required. This helps stop energy from getting into the studs, which will stop sound transmission not only to adjacent rooms, but also to areas above the room. The entire floor, especially under the wall framing, needs underlayment treatment.